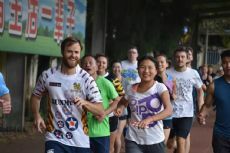 Since its establishment in 2011, the #Kunming Flying Tigers #Rugby Team has recruited players from more than 40 countries. Now it has 35 members, both male and female, including students, businessmen to freelancers aging from 18 to over 50. The team is named after the legendary Flying Tigers which is officially known as the American Volunteer Group of the Chinese Air Force during the World War II. Coincidentally, one of its founders is from the U.S..
Back to 2011, when an American watched the 2011 Rugby World Cup together with his New Zealand friend in Kunming, a thought came to themhy not to build a team themselves? They posted the players recruitment information online and received applications quickly. Marta from Ukraine is the captain of the female team. In 2012, when Marta was a university teacher in Ukraine, she visited Kunming. She then started a journey to explore Yunnan ethnic culture and cuisine. What fascinates her most is the diverse ways of cooking potatoes in Yunnan. "I like stir-fried potato slices, deep-fried potatoes, Grandma Potatoes and potato cakes. But when it comes to my favorite, I will say deep-fried potatoes," said Marta. Teddy from the U.S. was one of the first players of the Kunming Flying Tigers and now he is the captain of the team. It is not simple to manage a multicultural team but Teddy thinks that it's worthy to do everything he can for the sport and the team he loves. Teddy has visited Tengchong, Dali, Lijiang, Yuanyang and many other places in Yunnan since he came here 6 years ago. For him, having a road trip is the best way to enjoy the beauty of Yunnan.